Among many examples of fine town planning in Pakistan are North Nazimabad Karachi, Model Town Lahore, Federal-B-Area Karachi, Islamabad Master Plan, Wah Cantonment, Eight Bazaars of Faisalabad and many more in other cities. In today’s post we will cover North Nazimabad, Karachi. 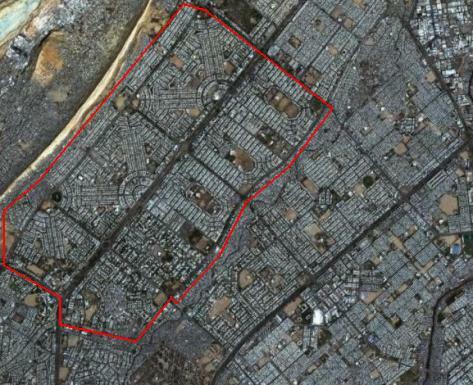 The satellite image below shows North Nazimabad’s 20 residential blocks bound in red polygon. 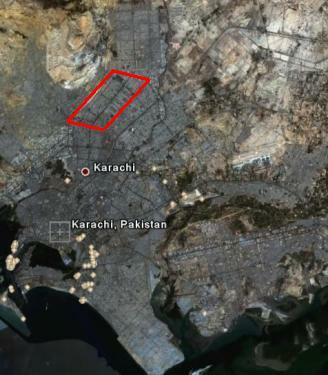 East of NN is Federal-B-Area where as North of NN is North Karachi and Buffer Zone. Whenever the aesthetics of Civil Engineering and Town Planning Projects is considered; it is an accpetable fact that curves and gradiants are considered more natural than squares or rectangles. 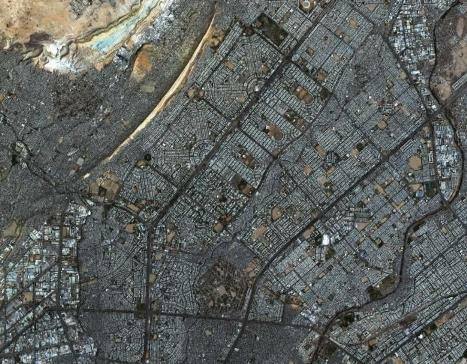 The photo to the right shows North Nazimabad’s location in a larger settled area view of Karachi city. Uptil late 1950s, Karachi’s northern most settlement used to be Nazimabad. Being the Capital of Pakistan, and as the population of the city grew, need arose to house federal employees in better planned neighborhoods. Localities of Federal-B-Area and North Nazimabad were thus planned to house Federal employees. As far as aesthetics, ameneties, and grandeur was concerned, no other locality in Pakistan could match the town planning of North Nazimabad. The planning of North Nazimabad was done by an Italian company of Planners and Architects called Carlo Scarpa & Aldo Rossi in the late 50s. In 1958 it started as new suburban development called the KDA Scheme number 2 and later it became famous by its popular name of North Nazimabad. The locality of Nazimabad which lies south of North Nazimabad was named after Pakistan’s second Governer General, Khwaja Nazimuddin. Since KDA Scheme 2 was being developed in north of old Nazimbad, it became popular by the name of North Nazimbad or some times just North. In 1962, the Capital was shifted from Karachi to Islamabad and the planned neighborhood of North Nazimabad became available to general public instead of originally planned employees of Federal Government only. North Nazimabad consists of 20 residential blocks identified with alphabets from A to T. The plot sizes across all North Nazimabad are divided into 6 categories viz. A, B, C, D, E and F. Plots of A category have an area of 240 square yards, B = 400 Square Yards, C=600 square yards, D=1000 square yards and F=2000 square yards . 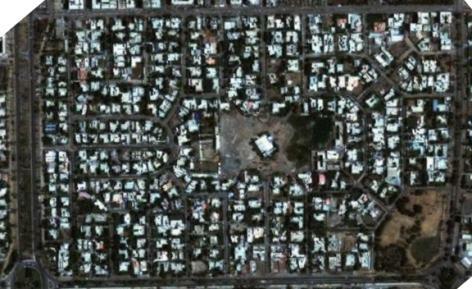 Therefore a sample house address in North Nazimabad of A36/T means House number 36 with an area of 240 square yards located in Block T.
The photo to the left is satellite image of Block A of North Nazimabad. North Nazimabad is also famous for its main mass transit arterial called the ‘Sher Shah Suri Road’ being a 440 ft wide thoroughfare. There are several 220 ft wide boulevards with rain drains dividing the two lanes. In the period 1983-87, during the mayorship of (late)Abdus Sattar Afghani, whole North Nazimabad locality was planted with hundreds and thousands of Eucalyptus saplings. As fast as Eucalyptus grows, within few years whole Nazimabad town turned into a green paradise of tall Eucalyptus trees. However, lately these eucalyptus trees have been mostly cut down for reason better known to the subsquent city governments. One reason that I have heard is that Eucalyptus is a water thirsty tree and so many of the eucalptuses in North Nazimabad were causing the ground water level to go down. During the same era, in order to localize the neighborhood names, North Nazimabad was renamed as ‘Taimuria’ and Federal-B-Area was renamed as ‘Mansura’. With the demse of Government of that time, the new names also met their natural death and never caught a mass acceptation. Today the only remnants of the name Taimuria in North Nazimabad are the ‘Taimuria Police Station’ and a ‘Taimuria library’. 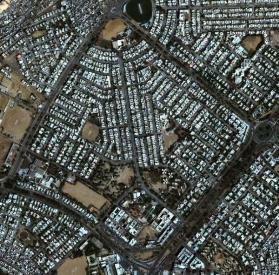 The photo to the right is Block B of North Nazimabad . North Nazimabad of today has lost much of its past glory. Just like many localities of big cities, businesses from city center slowly creep into residential areas and people of these area start moving further outward to suburbs. Same has happened to North Nazimabad. The once peaceful residential locality of Karachi is now fast turning into a commercial market. 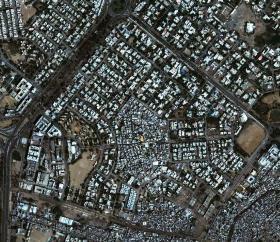 The photo below shows Block F of North Nazimabad. Many of the plots in Block F were of area 2000 sq feet. They have mostly been converted to something commercial e.g. Private Schools and Universities. North Nazimabad of today boasts of atleast four First-Class Cricket Grounds, several hospitals, A Medical and Dental University, Several HSC Colleges, Taimuria library, several parks and sustained commercial activity which makes it a complete city inside the city. In 2001, North Nazimabad was declared as one of the 18 towns of Karachi. were added to North Nazimabbad proper. North Nazimabad is included in the Karachi Mass Transit Plan (KMTP) of 1970s. The Orangi-Cantt Station mass transit corridor touches Block A and B of North Nazimabad. North Nazimabad also has a Railway Station on Karachi Circular Railway Route. So whenever the KCR is fully revived on its loop, North Nazimabad will benefit. 1. The Four First-Class Cricket grounds of North Nazimabad: Bakhtiari Youth Center A Ground (Block S), KDA Stadium (Block S), Syed Asghar Ali Shah Stadium (Block C), which also held a 3-day International between Pakistan and Zimbabwe and KCCA Stadium (Block N). 2. In 1960, North Nazimabad was connected by Karachi Circular Railway Service with its Railway Station in Block B called ‘North Nazimabad’. The station remained operation until 1999. KCR service got suspended in 1999. 3. Postal Code of North Nazimabad is 74700. Ready For Your Geography Quiz? 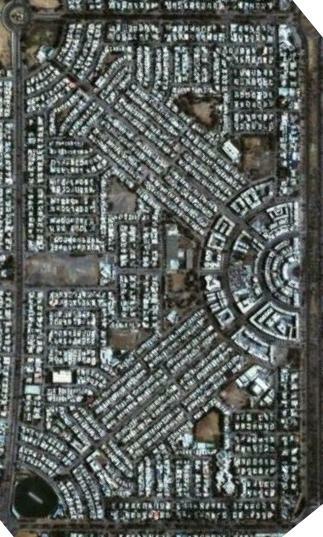 So in the satellite image below, can you try to find out where is North Nazimabad located? Answer is given above in the first map of this post. your work is really great ..